The Coalition for Good Governance and Change Initiative has described as an insult to Nigerian the resignation of Justice Walter Onnoghen, the former Chief Justice of Nigeria. The group said Onnoghen’s infamous resignation was belated because he had succeeded in battering the Nigerian judiciary sector before taking the exit door. 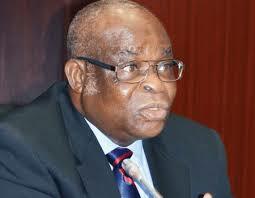 Recall that Onnoghen had on Friday resigned from office following the recommendation by the National Judicial Council. Speaking on the development, Comrade Okpokwu Ogenyi, National Coordinator of the group in a statement on Monday said the resignation of Justice Onnoghen was indeed shameful as well as infamous because his actions have brought international embarrassment to the country, thus, making Nigeria a laughing stock in the comity of Nations. We view with grave concern the recent resignation of Justice Walter Onnoghen as the Chief Justice of Nigeria after a recommendation by the National Judicial Council (NJC) to President Muhammadu Buhari for his retirement. The Coalition for Good Governance and Change Initiative frowns at such unwholesome behaviour by a supposed Chief Law Officer of the country in dragging the reputation of the judicial arm of government in the mud for his selfish interest. By his actions, he has indeed proved to the world that he has never been an honourable Justice, but one that was out to enrich himself at the detriment of dispensing justice and ultimately making a mockery of the revered judicial arm of government. The Coalition for Good Governance and Change Initiative wishes to state in unequivocal terms that the action of Justice Walter Onnoghen is indeed despicable and an indication that he had been frolicking with politicians who attempted to heat the polity unnecessarily on his behalf when he was suspended. By his resignation, it has indeed become common knowledge that Justice Walter Onnoghen had ulterior motives for his actions and inactions while he held sway as Chief Justice of Nigeria. We are consequently forced to believe that his ultimate aim was to bring great disgrace to the judicial arm of government, and to paint the executive arm of government in bad light. This much he achieved by refusing to tow the path of honour despite the glaring pieces of evidence that he indeed committed infractions by deliberately refusing to declare his assets as stipulated by the law. We are also constrained to ask why it took this long for Justice Walter Onnoghen to tender his resignation? Probably he realized that his political backers have jettisoned him to his fate and hence the hasty decision to tender his resignation after the NJC has recommended his retirement from the Supreme Court. The Coalition for Good Governance and Change Initiative believes that individuals such as Justice Walter Onnoghen who have displayed questionable characters by causing national embarrassment to the Judicial arm of government and the country at large are not deserving of retirement benefits. Granting such individuals retirements benefits amounts to insulting the sensibilities of Nigerians who have been denied justice and fairness while he held sway as the Chief Justice of Nigeria. The Coalition for Good Governance and Change Initiative rejects the move by Justice Walter Onnoghen to manipulate the system and further insult the sensibilities of Nigerians. Now that he has tarnished the image of the Judicial Arm of Government, he wants to take the honourable route. This is insensitive and criminal by all ramification. The Coalition for Good Governance and Change Initiative wishes to inform the members of the general public that the resignation of Justice Walter Onnoghen at this material time is infamous as well as an insult to the generality of Nigerians.